Annabelle Hawthorne Morton had always taken care of her family. This is why when her father had been caught trespassing, it was Annabelle who went to rescue him, and offered herself in his stead. Lord Malachi Hawthorne, Earl of Markham immediately knew that Annabelle was too good for her father, and himself for that matter, but that didn't stop him from making the bargain. He knew what was said of him, he was a beast. In fact, his appearance was beastly due to a magical battle with his sister. However, Annabelle couldn't completely see his beastly appearance. She was losing her eyesight due to a magical spell gone awry. Yet magical mishaps weren't the least of Malachi and Annabelle's problems. There was a conspiracy in the village which made Malachi appear beastly in attitude as well as appearance. There was also the long standing war which threatened to come all the way to the castle steps. Friends would prove to be enemies, and enemies perhaps allies. Yet through it all, it would be the love that Malachi and Annabelle felt for one another that would sustain. 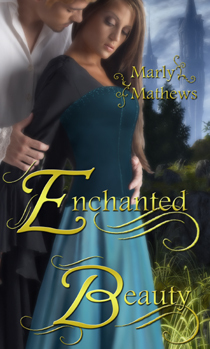 Enchanted Beauty was a fascinating romance with a unique twist to the Beauty and the Beast story. There was a diverse cast of secondary characters, each with their own individual personalities. The setting is in a magical realm, and there was a vast array of magical creatures and beings. This story truly showcased Ms Mathews' creativity.